Having royally overdone it last weekend it was difficult to make the effort to get up this morning - I've just spent three days in bed recovering, but the chance of taking photos of another Barnsley war memorial seems to have been a large enough carrot to tempt me out of the house. We were shown into the church by two friendly chaps and directed to four window panels and a large ornate plaque at the front of the nave. There was also a small plaque to soldiers who died in World War Two, but unfortunately my photograph of this did not come out very clearly. I think I should take the OH and his big camera and tripod with me on these expeditions! 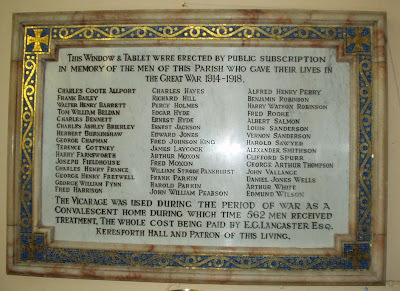 The windows were in memory of Fred Johnson King, whose name appears towards the centre of the memorial plaque. 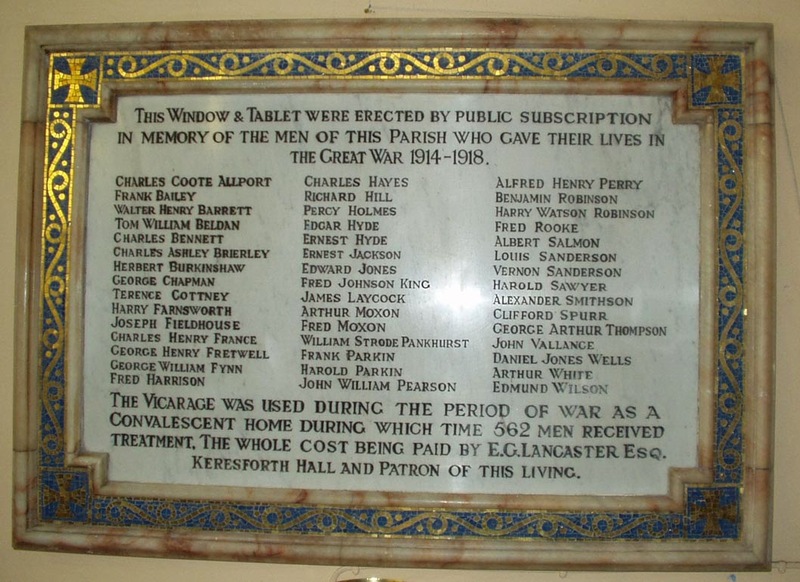 Along with the names of 45 men who lost their lives the plaque also commemorates the vicarage being used as a "convalescent home during which time 562 men received treatment. The whole cost being paid by E.G. Lancaster Esq. Keresforth Hall". 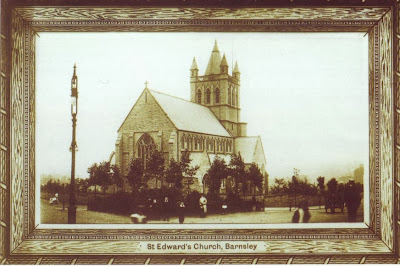 This is a fascinating detail and my friend GB is very interested in this aspect of St Edward's history. Her great uncle George Henry Fretwell is remembered on the plaque and her grandfather returned from the war severely injured. 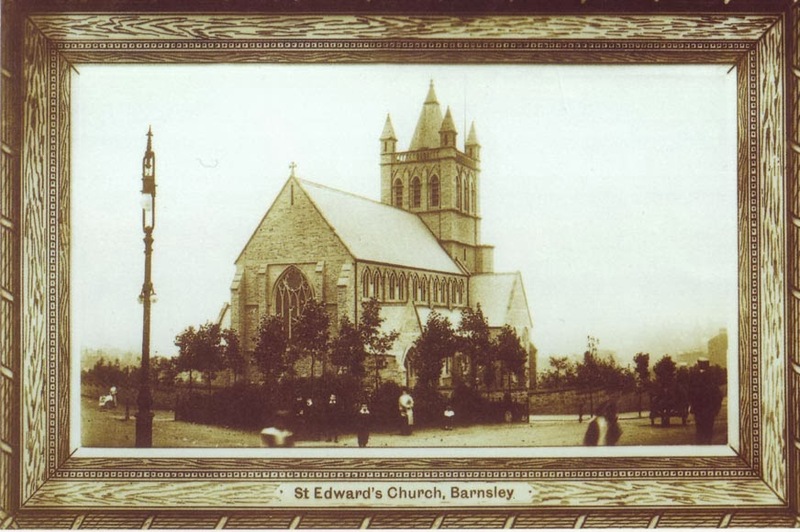 She is hoping to research the names and convalescent home in Barnsley Archives. The gentleman who showed me around, Fred Thompson, is also interested in researching these men. 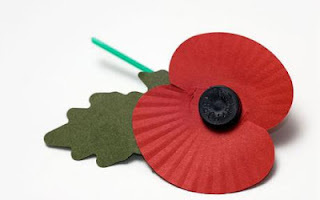 He would dearly like to get in touch with any descendants or relatives of these soldiers with a view to organising a commemorative service at some point in the future. He can be contacted here. I have transcribed the list of names. Again I note several instances of the same name, two men by the name of Hyde, two Moxons, two Parkins, two Sandersons and two Robinsons. Were these men brothers or cousins? Are any of your great grandfathers or great uncles listed here? Please get in touch with either myself or Fred if you can help us in our research. You are doing a great job, Linda, I have searching for any memorial which includes Benjamin Robinson. Thanks to you I have found him on St. Edwards Memorial.